Welcome to the Official Cathy’s Crafts Walkthrough! Follow the adventures of would-be artist Cathy as she struggles to establish her creative spirit within the community of Snuggford. This walkthrough features in-depth tips and tricks per day to help you obtain the highest scores. And of course, no official walkthrough would be complete without all hidden mouse locations! Simply scroll or click on a section below to get started. 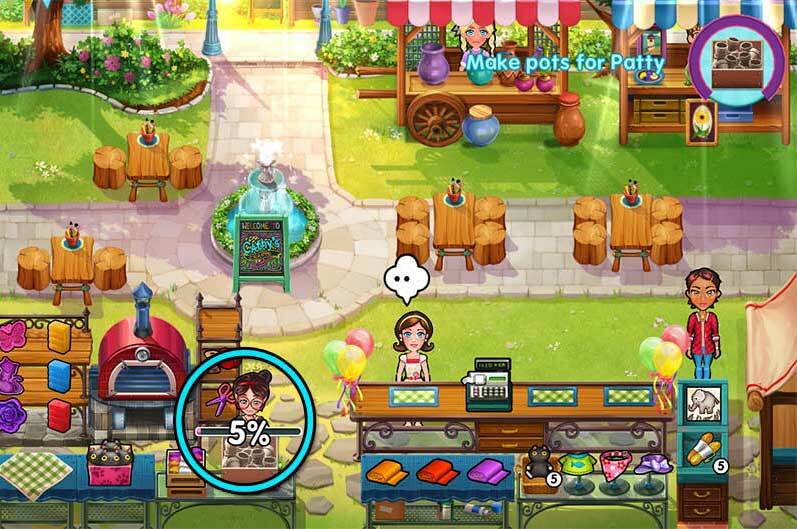 Whether you’re looking for the basics of how the game works or familiarizing yourself with customers, this section contains all the general tips and tricks you need to get started. You will be playing the role of Cathy – a sweet resident of Snuggford with a kind heart and creative mind. 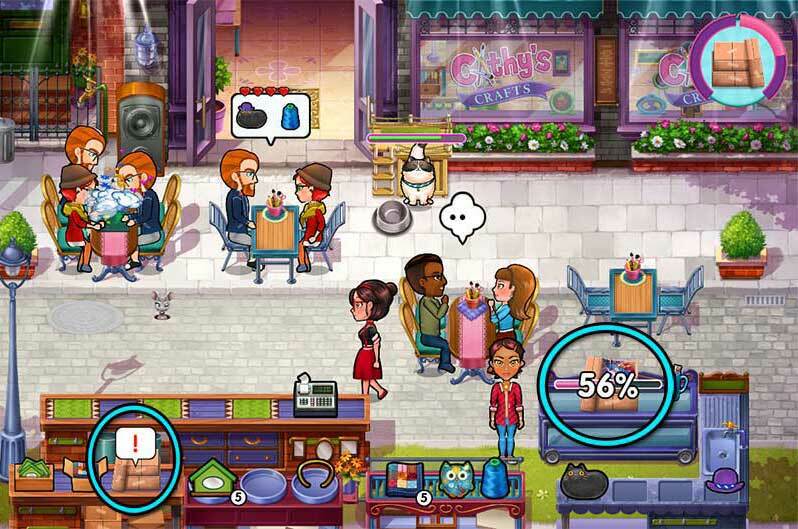 Cathy will run a series of shops throughout the game. These specific shops are divided into chapters, and the days in these shops divided into levels. Each level plays out from shop opening to shop close. Customers will enter a shop looking for specific products. When a customer decides what they’d like, a bubble will pop up over their head displaying the item(s) of their choice. Click on the matching item in the shop, followed by the customer in order to give them their order. 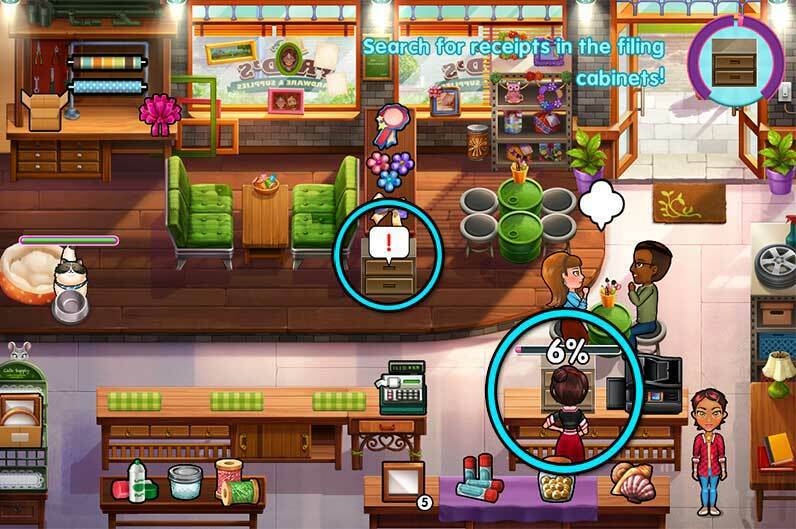 Once their order is complete, a customer will move to the cash register, and a money icon will appear. Click on the cash register to check them out. Sometimes customers will need a little extra help if they become frustrated by their projects. When this happens, a bubble with Cathy’s face will pop up. Click on the customer to help them with their project. As always, the faster you help a customer, the happier they will be. The happier a customer is, the more they will tip, and the higher your score will be. Happiness is indicated by a series of hearts. When a customer loses hearts, the score they will give you lowers. If a customer loses all their hearts, or has nowhere to go within the shop, they will leave. 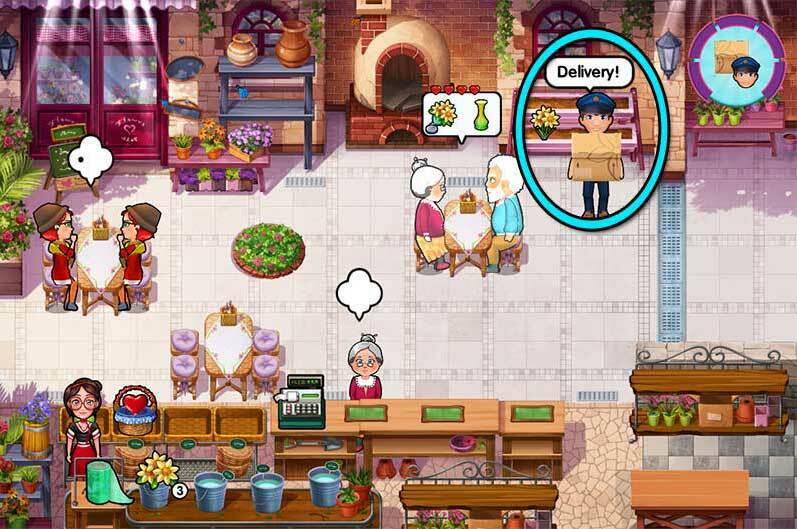 Try to serve customers as quickly as possible while keeping them happy in order to obtain high scores! Some days will feature a special objective. 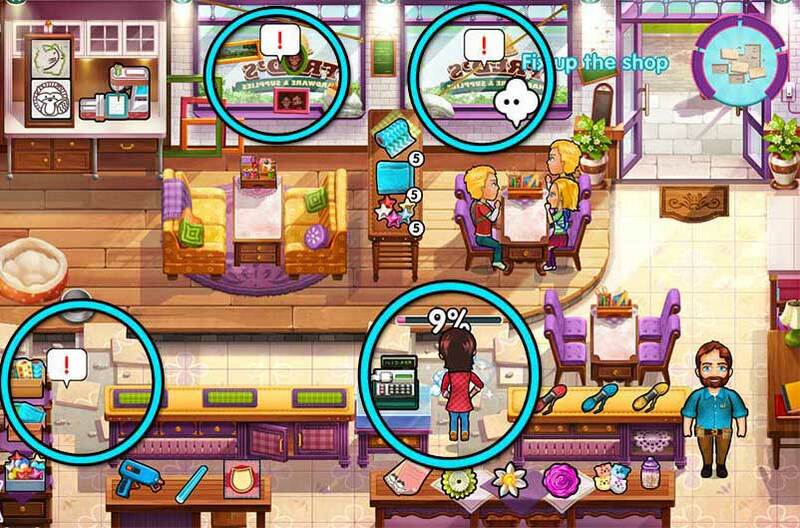 Indicated by an icon in the upper right corner of the screen, special objectives are active throughout the course of a day in their given level. 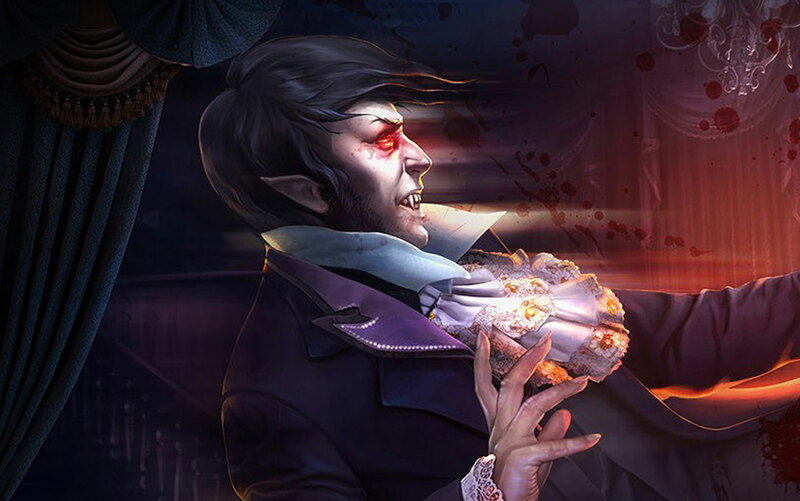 Complete these special objectives before the day’s end to achieve special bonuses. After clicking “Play” on the opening screen of Cathy’s Crafts, you will be taken to a level select map. Navigate the map by clicking and holding your mouse button, moving your cursor left or right to scroll the map. A series of stars will indicate what your current score on any given level is. A checkmark indicates you’ve completed a special objective, and a mouse means you’ve found the secret mouse hidden in that location. 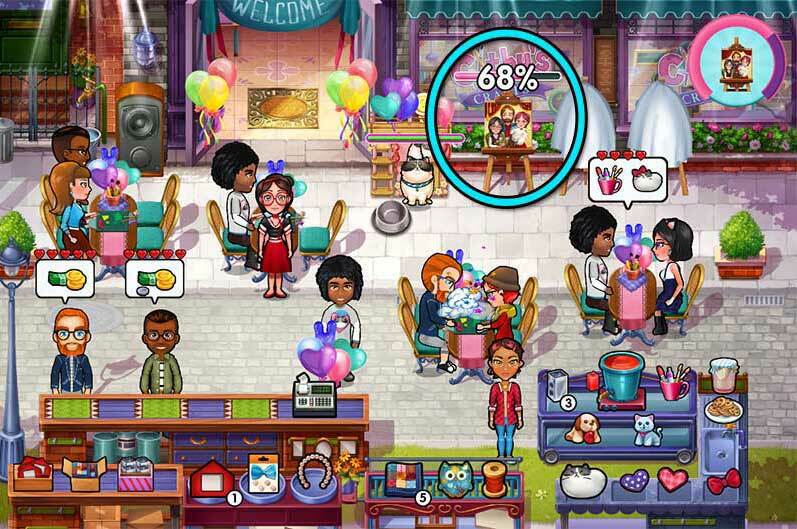 Cathy’s Crafts features several unique customer types, which may or may not change as you progress to new shop locations. Customer Type – The name of the type of customer. Chapter(s) Encountered – Locations where a type of customer may appear. Patience Level – Indicates how quickly or slowly a customer will lose hearts. Tip Rate – Indicates how much extra a customer will tip if you provide items they like. Likes Cats – Indicates whether a customer will become happy or angry if Ming appears next to their table. At the start of each level, you will be given the opportunity to select the products you would like to use for that level. If you choose a product that a specific type of customer likes, e.g. Seniors, then when you give that product to a Senior as per their request, they will tip extra. 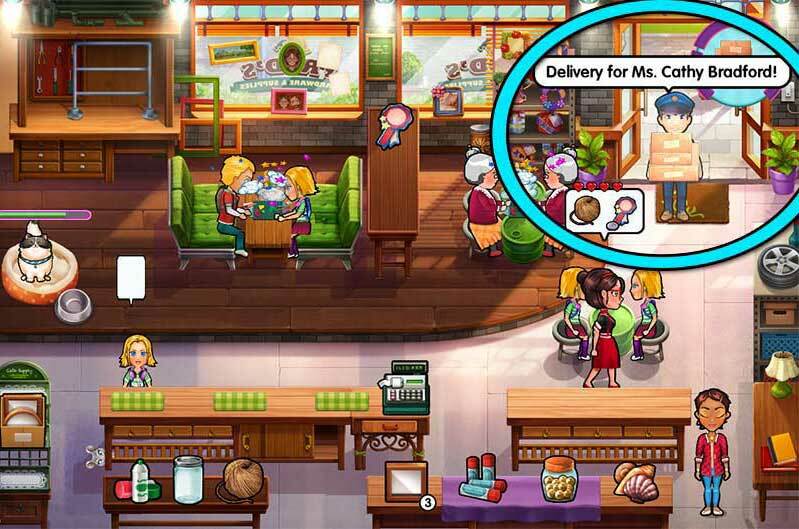 Items that will earn you extra tips display a small silver coin in the bottom right corner when a customer requests them. Choose these items carefully at the start of each level to make the most of your day and obtain the highest scores. The walkthrough below lists the ideal product line you’ll want to select per day to achieve the highest scores. In addition to tips, you will also be able to choose whether or not to upgrade items at the start of each level. Each time you successfully complete a level, you will earn a certain amount of coins. You can then use these coins at the start of a level to choose whether or not to purchase upgrades. Upgrades, once purchased, are permanent and will be saved for each location. Ming the cat will appear as a guest in some shops and locations. Ming is free-roaming and will wander to tables from time to time. Whether or not a customer type likes cats will indicate whether Ming increases or decreases a customer’s happiness. To refill Ming’s bar, or to remove Ming from a potentially bad customer combination, click on Ming’s bowl to feed Ming and draw the cat away. Ming does not appear in all locations, but can have a significant impact on boosting your score if used correctly. Each level contains a hidden mouse who will pop up from time to time. When you hear the squeak, keep an eye out for the elusive gray rodent. If you can’t find the mouse the first time, don’t worry – the mouse will pop up from time to time throughout the day, and always in the same location per level. If you can’t remember whether or not you found a mouse during the course of the level, simply look in the upper left corner of your screen: If there’s an empty mouse hole, you have not found the mouse yet. If a mouse appears, you have. Mouse locations are listed per level in the guide below. You can also click on Mice Locations to be taken directly to the section with a list of locations and screenshots showing where they’re hidden. Welcome to the Official Cathy’s Crafts Walkthrough! This guide is divided into sections according to chapter/location, further divided by level in order to provide you with tips, tricks, and mouse locations. If you’d like to view a mouse location, simply click on “Mouse Location” to be taken directly to a screenshot showing where you can find all mice per location. It’s that simple! Furthermore, in addition to stating the forecast of customers per day, a number of products will also be listed, in addition to the type of customer they’re geared toward. These products have been carefully selected by our gaming experts as the best products to use on a given day to achieve the highest scores. Without further ado, it’s time to get creative with Cathy’s Crafts! Cathy’s taking care of the family Hardware Store while her parents are away. With a haphazard boyfriend to follow, a stray cat occupying the shop, and the concerns of a best friend, Cathy’s sure to have her hands full! Mouse Location: At the corner of the raised curve in the floor, beneath the first table to the left of the door. Today acts as a sort of tutorial, introducing you to the basic mechanics of the game. To review the game’s basics, see the General Tips & Tricks section above. Throughout the day, customers will come in and place orders. Customers who sit at tables may become confused while crafting. When this happens, a “!” bubble will appear over their table. Click on the table to help them with their crafts! Mouse Location: Beneath the first table from the right. Uh-oh, there’s a fluffy cat loose in the shop! Use the help of Cathy’s boyfriend to catch the furry infiltrator! The cat will wander around the shop throughout the day. Whenever the cat has stopped moving, click on it quickly to have Mark pick it up. Do this 4 times before the end of the day to complete your goal. Tip! : If the day is done and you haven’t caught the cat 4 times yet, you will need to replay the day to complete the goal. Mouse Location: In the bottom left corner of the entrance doorway in the upper right corner. An additional crafting material will become available today. An additional jar of buttons/pile of seashells can be used to decorate frames as per customers’ requests. Today is also the first day the cat can help you around the shop. If the cat wanders near customers who like cats, their mood can improve. Similarly, the cat visiting customers who dislike cats will cause them to lose hearts. Click on the food bowl on the left to feed the cat and draw it away from customers as needed. Mouse Location: Peeking around the far left side of the checkout counter. 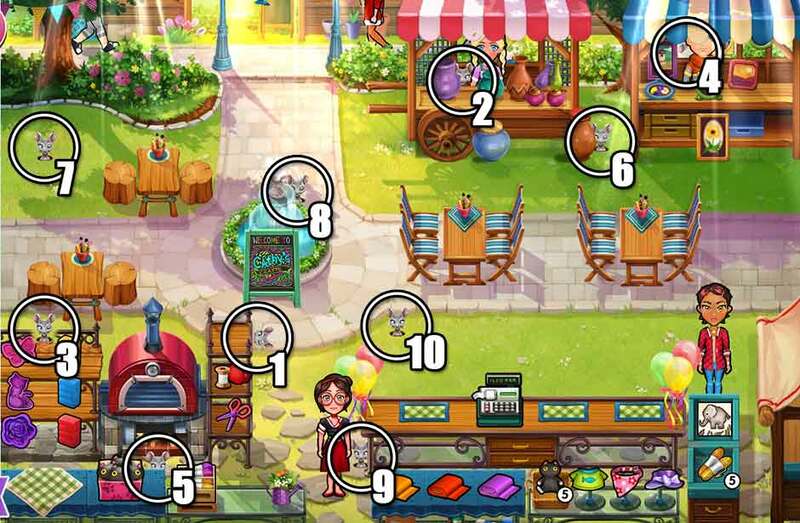 The new applique counter at the top of the shop can now be used. Pick up the packages from the mailman throughout the day. Watch for the mailman in the upper right corner. When he walks in and declares he has a delivery, click on him to collect the package. Do this 4 times before the end of the day to complete your goal. Mouse Location: In the first window to the left of the entrance door, just behind the picture frame. In addition to the new wrapping station opening today in the upper left corner, Jenny needs help making a gift. Click on the table on the lower right marked by the “!” bubble to help Jenny. A meter will appear displaying how far along you are on the project. Complete the project 100% before the last customer leaves the shop. Mouse Location: On the right side of the table displaying the appliques. A new printer is available today. Located on a counter near the lower right corner, you will need to collect discs and/or memory cards from customers who want prints. Collect these by clicking on the customer, then take them to the printer. Once the image has been printed, take it to the customer to complete the transaction. Mouse Location: At the top of the cabinet in the bottom right corner. There are two file cabinets in the shop today. Click on a cabinet marked with a “!” bubble to begin searching. Search both cabinets 100% for receipts before the last customer has left for the day in order to complete the day’s objective. Mouse Location: Outside the far left window, hanging upside-down in the upper right corner. Additional appliques are available to customers today via the applique counter. Be careful not to potentially confuse the appliques with the frame décor in the lower right corner of the shop. Mouse Location: Under the wrapping table in the upper left corner of the shop. Cathy isn’t around to take care of the shop today, but Kendra’s there to cover the shift. Select products according to the selection listed above to breeze through the day without any worries. Mouse Location: Between the flowers and the jar of buttons in the lower right corner, beneath the printer. Cathy’s parents are back, including her father, who will help around the shop today. 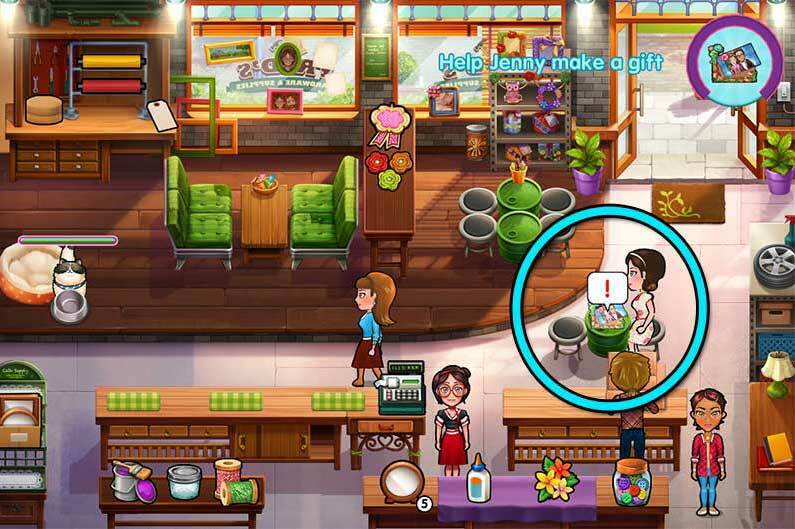 Click on tables which need to be cleaned in order to have him complete the task for you, leaving Cathy to focus on the customers at hand. With Mrs. Bradford’s encouragement, Cathy decides to check out the arts and crafts fair. Addressing Ming’s destruction of the patio section will have to be left to someone else! Mouse Location: Around the right side of the stone shelving containing the threat, to the right of the kiln oven. Today’s Cathy’s first day at the arts and crafts fair. In addition to providing basic crafting materials to customers, Cathy will be able to fire clay in the kiln oven on the left. Click on the mold on the lower left, followed by a clay color in order to fire it in the oven. As soon as it’s fired, click on it to add it to your tray. Mouse Location: In the pottery booth at the top of the screen, to the immediate left of the girl. Day 2 at the craft fair, and things could be going a bit better. That’s why today’s goal is to make a signboard for Cathy’s shop! Click on the signboard pieces in front of the fountain, indicated by a “!” bubble in order to begin assembly. Complete the sign before the last customer has left for the day in order to finish the objective. Mouse Location: At the top of the brick shelving containing the molds in the lower left corner of the screen. With a new signboard comes new customers, and the addition of a new mold for your clay! Pay close attention to the clay orders customers give and make sure you select the correct one. Remember to select a mold, followed by the clay color. Once the polymer has been completely fired, click on it to add it to your tray, then hand it to the customer who ordered it. Mouse Location: In the window of the painting booth in the upper right corner, between Rohan and the purple picture frame. A new Ming doll is available to customers today! 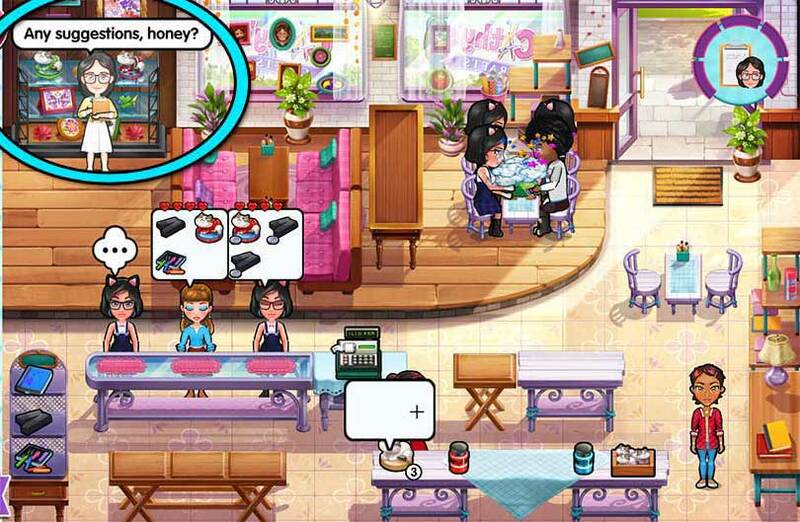 Click on the cat doll on the counter toward the bottom right corner, followed by the accessories as per the customer’s request. Once completed, hand the item to the customer. Ming dolls can combine any of the accessories, so pay extra close attention to customers’ orders! Mouse Location: At the foot of the kiln oven in the lower left corner, next to the box of Ming Doll refills. Cathy’s busy helping take care of Rohann’s booth today, so it’s up to Kendra to run the shop. Ming dolls will slowly become more popular, so remember to restock them when supplies are low. The restocking box is located in the lower left corner, below the kiln. Mouse Location: Next to the brown vase at the lower right corner of the pottery cart. Cathy’s back in charge today, and with her comes a new wave of customers. There will be a number of Suburban Moms as customers today, so customers will tend to be more impatient. Try to keep on top of orders and make sure to serve Seniors second, due to the fact they’re more patient. You will be able to line up combos with Hipsters and Suburban Moms in this way. Mouse Location: In the middle of the portion of lawn in the upper left corner. Several fliers have gone missing! Locate all 6 before the day is done to complete the day’s objective. Their locations are shown in the screenshot pictured. Mouse Location: Behind the top of the fountain, toward the upper right. Cathy is gone again today, so it will be up to Kendra to run the booth. In addition to this, she will also be responsible for cleaning all tables. Make sure to clean any dirty tables as soon as possible whenever you have a chance – don’t let things back up so that you start losing customers. Mouse Location: On the far left side of the counter with the cash register, beneath the balloons. Make pots for Patty today by clicking on the box of pottery near the kiln in the lower left corner of the screen. A bar will pop up showing your progress. Complete preparations 100% before the end of the day in order to complete the objective. Kendra will be nearby to help clean tables as necessary. Mouse Location: On the grass above the balloons and cash register, close to the circular stone pavement with the fountain. It’s the final day at the craft fair, and as a result, it’s busier than ever! Make sure your kiln oven is upgraded today, as is your fountain to keep customers as happy as possible. There will be high demand for Ming dolls, so take care that they remain stocked at all times. Your place in the finals depends on it! Cathy may not have placed first in the fair, but it’s the effort that matters. Things are back to normal in the Bradford’s hardware store. Or are they…? Mouse Location: In the middle of the raised floor, beneath the applique table. Today is very similar to the first day of Chapter 1. Mr. Bradford will be around to help clean tables this time. Click on the boxes in the far lower left corner to restock supplies as necessary. There is also a new sewing machine in the upper left corner you can use. Click on the stencil, followed by the sewing machine to stitch patterns as per customers’ requests. The rest is easy-going. Mouse Location: At the top of the 4-person table toward the left, beneath the first window from the left. New yarn balls are available today. Customers will order these in groups of three – either all the same color, or one of each. You will need to click on three yarn balls consecutively in order to add them to your tray. There is also a large influx of Suburban Moms today, so be prepared to deal with impatient customers. Mouse Location: At the top right corner of the counter with the yarn on the right, next to Cathy’s father. There’s new fabrics and appliques available to customers, in addition to a tape dispenser and/or glue gun on the lower left. Click on the two components to combine them in order to assemble the item for customers. Ming and Mr. Bradford are also present in the shop today to help out and bolster the moods of customers. Mouse Location: Peeking around the right side of the counter with the cash register. Ming is becoming progressively more popular. A new sewing pattern and notebook are available for customers today. Click on the notebook at the bottom of the screen and combine it with the accessories customers ask for to complete the item for delivery. There are a number of Students in the shop today, who don’t like it when Ming visits their table, so be sure to keep Ming fed to prevent upsetting them. Mouse Location: Peeking around the left corner of the bottom right table, to the left of the Ming notebook. Ming’s popularity is still growing, and fans will stop by today asking for pictures. Take 5 pictures of Ming with fans before the end of the day to complete your objective. Exactly 5 fans will ask for this, so make sure you don’t miss any! Ming will pose and fans will have speech bubbles pop up when they’d like their picture taken. Click on them to take a photo – it’s that simple! Mouse Location: In the entrance doorway, peeking around the bottom of the door on the right. There’s a lot of fixing up to do around the shop today. There are 4 areas in need of renovation, each marked with a “!” bubble. Click on the area to clean it. 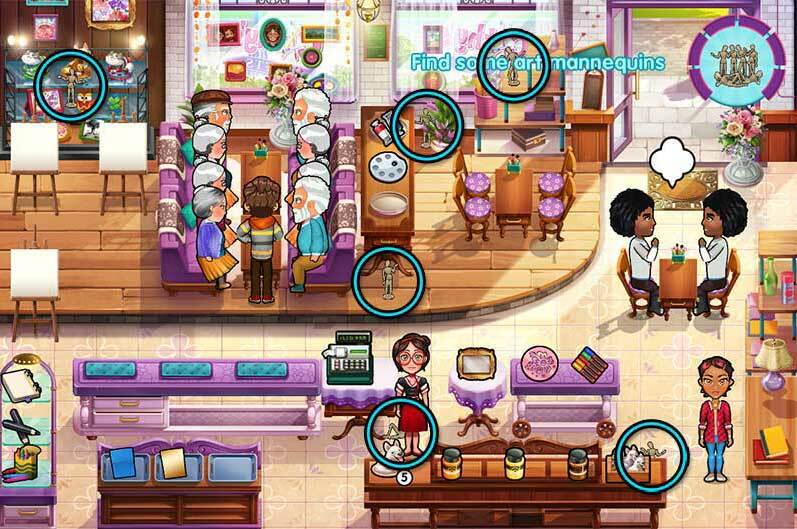 You will need to clear all 4 areas before the last customer leaves in order to complete today’s objective. Tip! : It’s very unlikely you will be able to complete the objective before the shop closes, so focus on completing the job while your last customer waits to be checked out at the register. Mouse Location: Upside-down beneath the light between the two windows at the top of the screen. Things are back to normal in the shop today, though Ming isn’t around today. Focus on customers as per usual, making sure to keep supplies stocked as needed so as not to run out. Mouse Location: Underneath the table with the sewing machine in the upper left corner of the shop. Cathy and Ming both return to the shop today, with Kendra hanging around as help to clear tables. Customers are fairly equal in ratio today. Remember that Students don’t like Ming, while Bikers love Ming. A lot of your performance today will rely on Ming visiting the right tables and keeping away from the wrong ones. 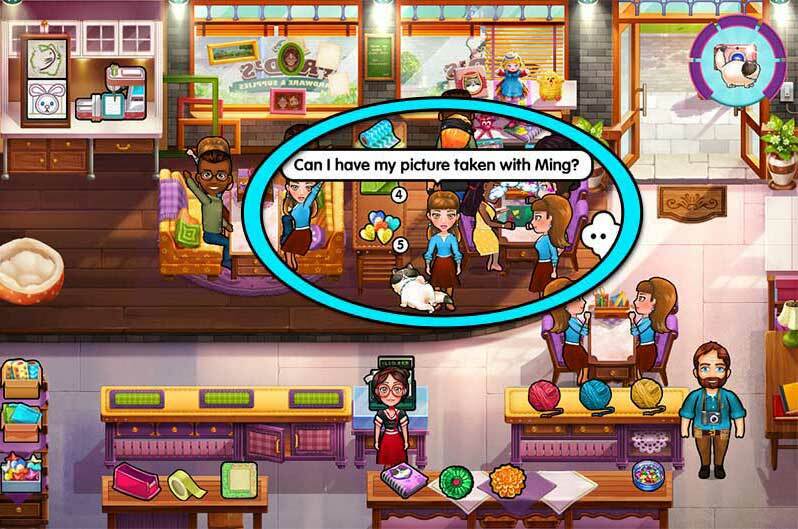 Click on Ming’s bowl to lure Ming away from customers who may not appreciate the company. Mouse Location: At the top of Ming’s cat bed on the left. Today will be fairly easy-going. Focus on keeping your products in stock and keeping Ming happy. The rest is fairly smooth-sailing. Select the products listed above to easily obtain your 3-star score goal. Mouse Location: In the right window, behind the red notebook with Ming on the cover. Cathy’s run out of the shop, but Kendra’s there to take her place. Mr. Bradford is there to clear tables, and Mrs. Bradford is nearby to feed Ming. This allows you to focus on serving customers as quickly and smoothly as possible. Don’t forget to keep your products stocked! Cathy decides to try her hand at flower design, but will she be able to discover her confidence? Mouse Location: At the left side of the table in the bottom right corner of the screen. The mailman will show up with deliveries today. When he has a package for you, a speech bubble will pop up over his head. Click on him to collect the package. Collect 5 packages before the end of the day to complete the objective. Mouse Location: Over the bottom portion of the silver drainage grating toward the right side of the screen. For today’s objective, in addition to wrapping flowers, you will need to design 2 flower arrangements. The arrangement part is already done – all you need to do is assemble them! Click on the “!” bubbles over the counters on the lower right. 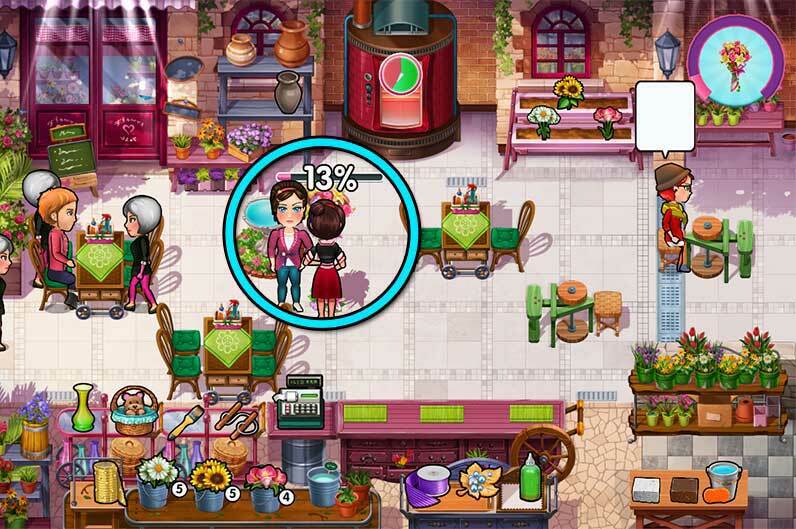 Complete both arrangements 100% before your last customer leaves the shop to complete the objective for the day. Mouse Location: On the tile floor beneath the flower refill stand. Today’s goal is to design a centerpiece. Similar to the previous day’s objective, click on the arrangement on the counter on the lower right to assemble it. Assemble it to 100% completion before your last customer leaves to complete the day’s objective. Mouse Location: Behind the sign in the upper left corner of the screen. 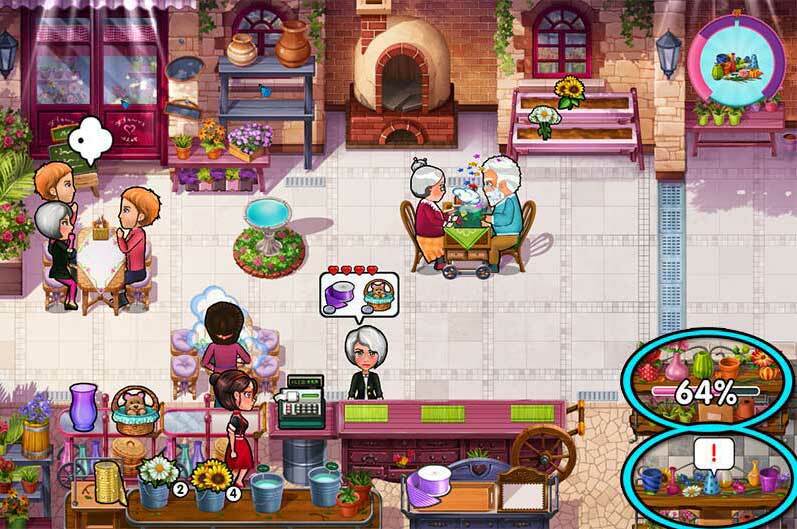 The tasks of the flower shop continue to expand, and today you’ll be checking flower inventory. There are 3 sheets you’ll need to fully check before your last customer leaves in order to complete your objective. Their locations are shown below. Mouse Location: Behind the right side of the fountain in the middle of the shop. Cathy will be busy with another task today, but you will still need to assist her. 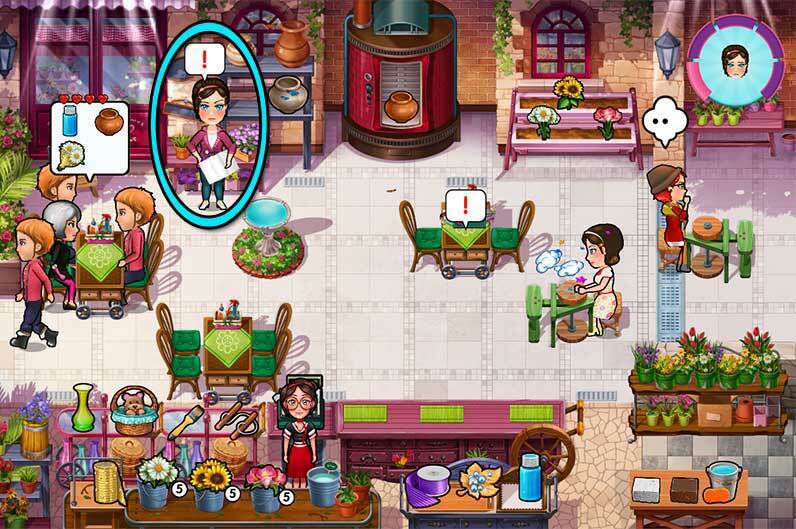 Playing as the flower shop apprentice, click on Cathy’s station to help her with her task. Help her complete her assignment before the last customer leaves to achieve your goal. Mouse Location: At the top of the main counter to the right of the cash register, between the first two green placemats. Today will introduce the pottery oven. 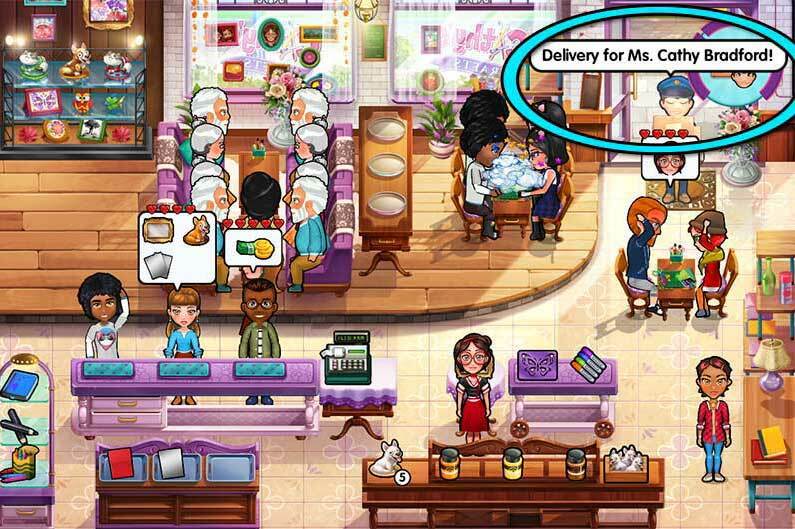 Located at the top of the screen, click on a pot on the shelf on the left, followed by the oven in order to bake it. Once the pottery is complete, you can take it to customers as per their request. Tip! : Try preparing a pot in the oven, then leave it there once complete. You can leave one completed pot in the oven without it burning or being ruined, which will allow you to give pots to customers even faster. Mouse Location: Underneath the left side of the bottom right table – the first single-person table from the left. There are no special objectives today, but today will be your first opportunity to upgrade the pottery oven. It’s highly recommended you upgrade this right away in order to provide pottery to customers even faster. Mouse Location: On the right side of the main counter to the right side of the cash register, behind the cart handle and wheel. Share ideas with Chloe throughout the day. When a “!” bubble pops up over her, click on Chloe to swap ideas with her. Do this 5 times before the end of the day to complete your objective. Mouse Location: At the bottom left corner of the pottery kiln at the top of the screen. Today’s goal is to finish the centerpiece in the middle of the shop. Chloe will work on this while Cathy helps the daily customers, but will need Cathy’s help to finish it. 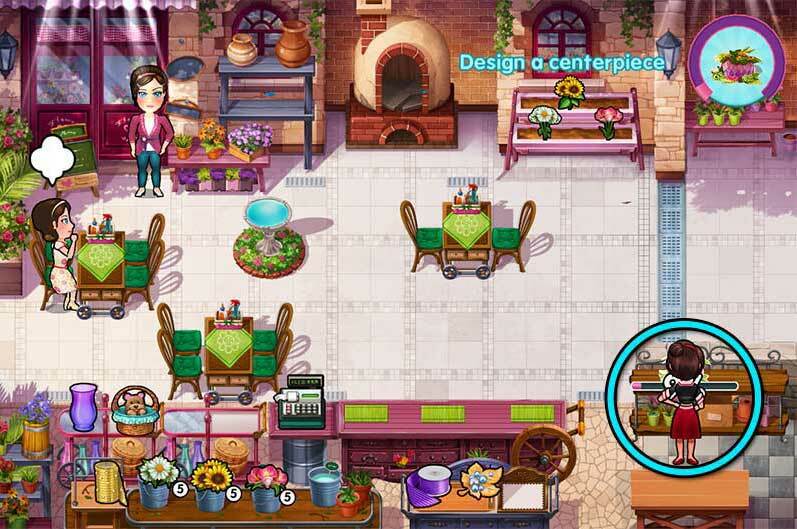 Click on the centerpiece and finish it to 100% completion before the last customer leaves to complete the day’s goal. Use the pottery trick mentioned above to aid Cathy today – prepare a pot in the oven and leave it for the next customer in order to save time. Mouse Location: Hanging upside-down underneath the right side of the large centerpiece bouquet of flowers. Today pulls out all the stops, only Chloe will be helping Cathy by cleaning tables. Focus on serving customers and don’t forget to help them as needed. Today’s turnout is quite balanced, so be prepared to deal with a little bit of everything! The hardware store has been converted into a craft shop. How will Cathy take to running her own store? Mouse Location: To the left of Cathy when she’s standing at the cash register, at the foot of the customer counter. Mrs. Bradford will pop up from time to time today, asking Cathy for ideas. She will show up in the upper left corner, a speech bubble cropping up asking for advice. When this happens, click on her to share ideas. Do this 5 times before the end of the day to complete your objective. 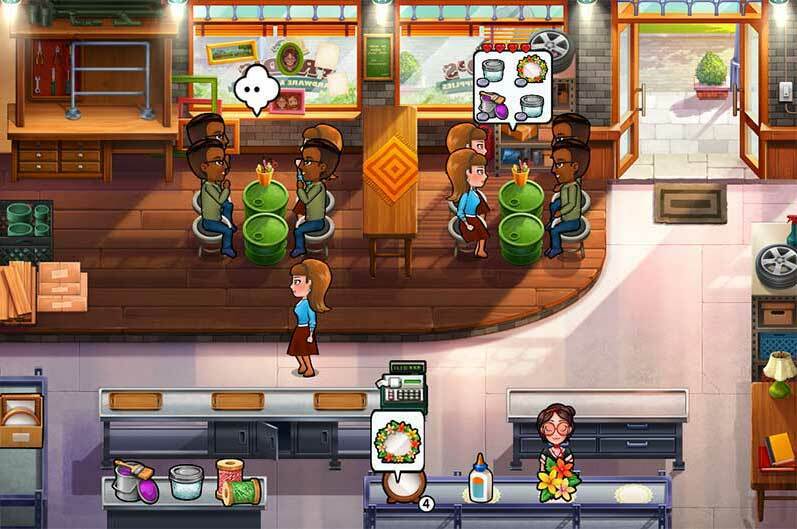 Don’t worry about cleaning tables – that’s why Kendra’s here to help! Just click on a table as per normal and your best friend will do the rest. Mouse Location: At the bottom of the shelf in the upper left corner of the shop. A number of seniors are in the shop today, and you’ll need to prepare stencils for their class. Next to the new stencil table on the lower right is a table on which you can prepare them. Click on the table marked with a “!” to assemble the stencils. Complete the assembly before you last customer leaves to complete today’s objective. Mouse Location: Between the platter table and the flower pot beneath the window closest to the door at the top of the screen. Today there’s a new kind of craft paper available. Located on the lower left, click on the paper twice to collect the two pieces needed when customers request it. Keep a sharp eye on dog-painting requests, too, since they can consist of any combination of colors. Mouse Location: On the left side of the bottom right table housing the corgi figurine. Three deliveries will show up today. Keep an eye out for the mailman in the upper right corner near the door. When his speech bubble pops up, click on him to collect the package. Receive all deliveries before the end of the day to complete your goal. Mouse Location: Behind the right side of the top shelf to the left of the entrance doorway. Six art mannequins have gone missing. Locate all 6 before the end of the day. Their locations are shown below. Mouse Location: Peeking out from the bottom left corner of the left couch where the seniors are sitting. Today will see a near full spectrum of products, and a continued strong presence of DIY Besties customer types. These types are very impatient but tip extremely well, so place priority on helping them as quickly as possible. In addition, be careful to keep all canvas stations on the upper left clean! It’s possible for a customer to stand in front of the “!” bubble. If you notice a customer who appears stuck, try clicking on the canvas to see if it needs to be cleaned first. Mouse Location: At the top left corner behind the left couch where the seniors are sitting. An additional type of crafting paper will become available today. Pay close attention to customer’s requests. If you accidentally make a mistake, click on the item you no longer need on your tray on the lower left to remove it. Mouse Location: In the bottom right corner of the first window from the left. More customers will request a combination of crafting paper today. Customers can ask for either two of the same color paper, or a combination of all three types. Take your time clicking on pieces of paper – clicking too quickly can sometimes result in pieces being missed. Mouse Location: Behind the top right corner of the bottom right cabinet, behind the refill box of corgi figurines. Today is smooth-sailing with easy customers and the help of Kendra on the tables. Use the tricks mentioned in the levels above to complete the day easily with a 3-star rating. Mouse Location: On the floor between the table holding the frame and the cart holding the stencils. A balanced variety of customers will be in the shop today. Keep your products stocked, keeping hard-to-reach items on your inventory tray as necessary to match demand. Put extra priority on keeping painting stations clean. Bad news awaits the seniors, but it won’t end badly if Cathy can help it! Mouse Location: In the doorway at the top of the screen, to the right of the doormat. Ming will be a part of the shop from the start of the day, wandering to tables from time to time. A large number of your customers will enjoy Ming’s company, so allow Ming to wander without paying too much mind. 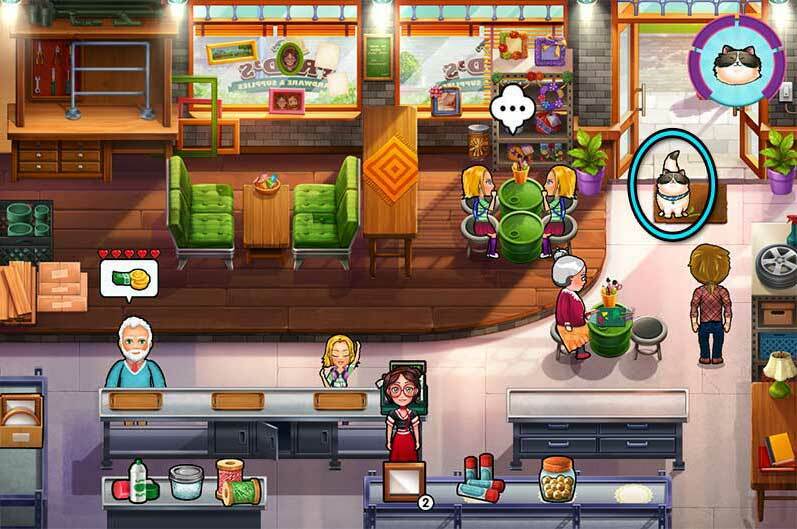 Remember you can click on Ming’s food bowl to draw Ming away from a table of customers who may not want the company. Mouse Location: In the middle of the cobblestone pavement, to the left below the first table on the left. There are two sets of boxes today which require unpacking. Click on the pile of boxes in the lower left and right corners to begin unpacking them. Unpack both to 100% completion before your last customer leaves to complete the day’s objectives. Mouse Location: Around the right side of the main customer counter, to the immediate right of the cash register. A balanced variety of customers will be in the shop today. Kendra’s around to help, and you’ll need to keep an eye on Ming to make sure the cat’s not upsetting anyone. You will also be able to give customers new Ming dolls as per request by combining the doll base with a bow accessory in the lower right corner. You can also combine jars with a plate of cookies on the right to provide this type of product. Mouse Location: Hanging upside-down from the “welcome” banner in the doorway at the top of the screen. The majority of your customers today will be Students, so prepare for low patience and small tips. Ming won’t be around, so you won’t have to worry about your furry companion upsetting today’s largest customer base. However, despite the fact Ming and the Students don’t always agree, Students will be eager to get their hands on the Ming doll and new heart accessory. Combine the heart with the Ming base just as you did the bow to complete the product. Mouse Location: Behind the fence in the upper left corner of the screen. Starting today, you will be able to make candles! Click on the candle mold, followed by the wax pot. Once the meter is fully filled, the candle will be ready. You can prepare one candle at a time, however, once prepared, you can safely leave the candle at the pot. A small candle icon will indicate a candle is ready here. Always have a candle prepared in order to serve customers quickest. Ming is also back to keep customers happy. Mouse Location: Behind the candle-making station, between the candle mold and the pot of wax. Today you can upgrade the candle wax pot so that candles take less time to make. In addition, you’ll be given an additional day-goal: start painting a concept. Click on the painting marked with a “!” in the upper right corner to begin painting. Complete your concept before your last customer leaves in order to complete the day’s objective. Mouse Location: Peeking out from the right side of the doorway at the top of the screen, above the balloons. Find photos for inspiration in today’s objective. There are 7 photos scattered around the front of the shop area. Find all the photos before the day is done to complete your goal. The photo locations are shown below. Mouse Location: In the top of the window, above the “C” in “Cathy’s Crafts” above Cathy’s canvas. A new day demands a new concept. Click on the easel in the upper right corner marked with a “!” to begin painting your concept. Finish it before the end of the day to complete your goal. Mouse Location: In the middle of the cobblestone area, just below Cathy’s canvas. A balanced variety of customers will show today. Ming and Kendra are also available to help. While helping customers, you will also need to work on your painting. Click on the easel marked with a “!” to work on your painting. Make sure you complete it before the end of the day in order to achieve your objective. Mouse Location: In the window above Ming’s cat house, between the balloons. It’s the last day of the fundraiser! You won’t have to worry about any Students today, so the only customers you will need to focus on keeping Ming away from are the Hipsters. In addition to this, today’s goal is to complete your painting! Click on the easel marked “!” to work on it. Complete it before the last customer leaves, and your goal will be achieved. Congratulations! You’ve completed all levels of Cathy’s Crafts! Hidden in each of the game’s levels is a mouse. This section is divided into sub-sections per shop, listing all mice locations for each level. Level 1 – 1: At the corner of the raised curve in the floor, beneath the first table to the left of the door. Level 1 – 2: Beneath the first table from the right. Level 1 – 3: In the bottom left corner of the entrance doorway in the upper right corner. Level 1 – 4: Peeking around the far left side of the checkout counter. Level 1 – 5: In the first window to the left of the entrance door, just behind the picture frame. Level 1 – 6: On the right side of the table displaying the appliques. Level 1 – 7: At the top of the cabinet in the bottom right corner. Level 1 – 8: Outside the far left window, hanging upside-down in the upper right corner. Level 1 – 9: Under the wrapping table in the upper left corner of the shop. Level 1 – 10: Between the flowers and the jar of buttons in the lower right corner, beneath the printer. Level 2 – 1: Around the right side of the stone shelving containing the threat, to the right of the kiln oven. 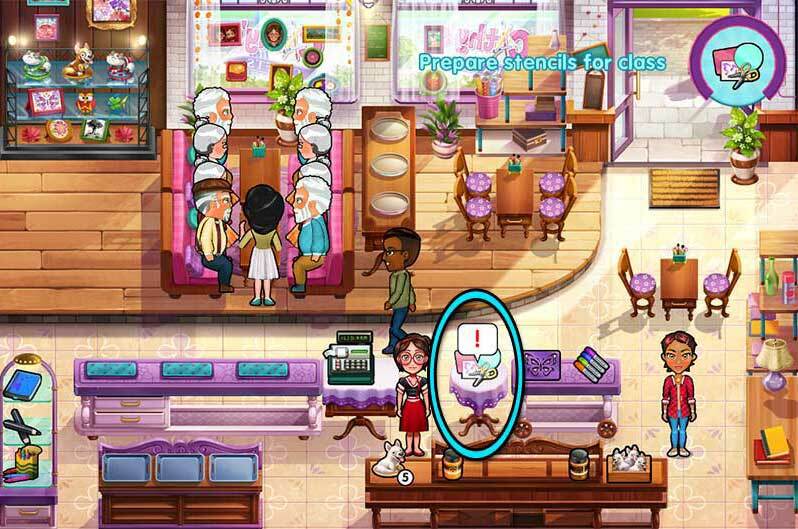 Level 2 – 2: In the pottery booth at the top of the screen, to the immediate left of the girl. Level 2 – 3: At the top of the brick shelving containing the molds in the lower left corner of the screen. Level 2 – 4: In the window of the painting booth in the upper right corner, between Rohan and the purple picture frame. Level 2 – 5: At the foot of the kiln oven in the lower left corner, next to the box of Ming Doll refills. Level 2 – 6: Next to the brown vase at the lower right corner of the pottery cart. Level 2 – 7: In the middle of the portion of lawn in the upper left corner. Level 2 – 8: Behind the top of the fountain, toward the upper right. 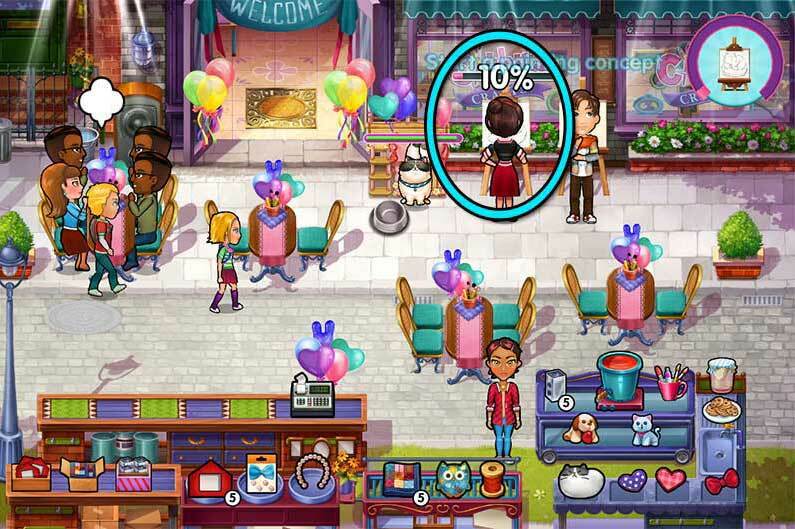 Level 2 – 9: On the far left side of the counter with the cash register, beneath the balloons. 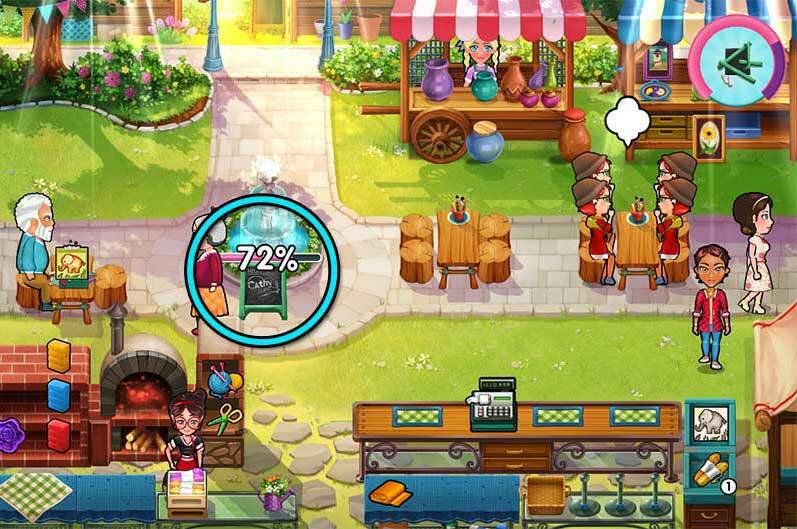 Level 2 – 10: On the grass above the balloons and cash register, close to the circular stone pavement with the fountain. Level 3 – 1: In the middle of the raised floor, beneath the applique table. Level 3 – 2: At the top of the 4-person table toward the left, beneath the first window from the left. 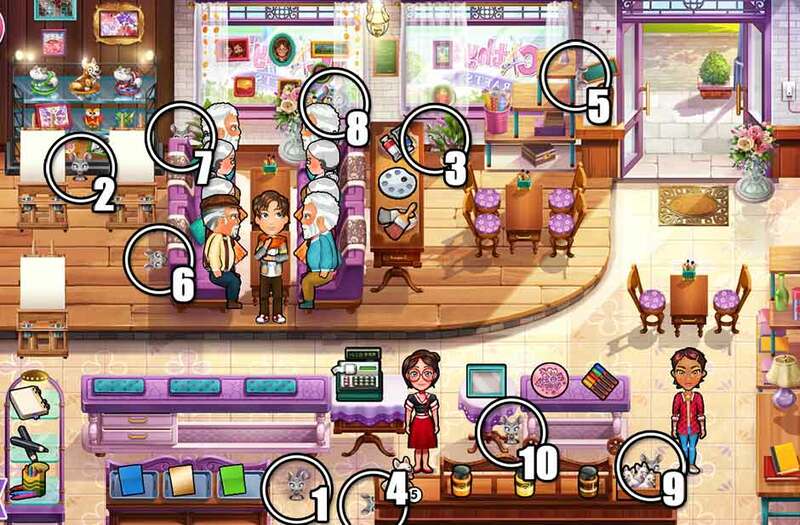 Level 3 – 3: At the top right corner of the counter with the yarn on the right, next to Cathy’s father. 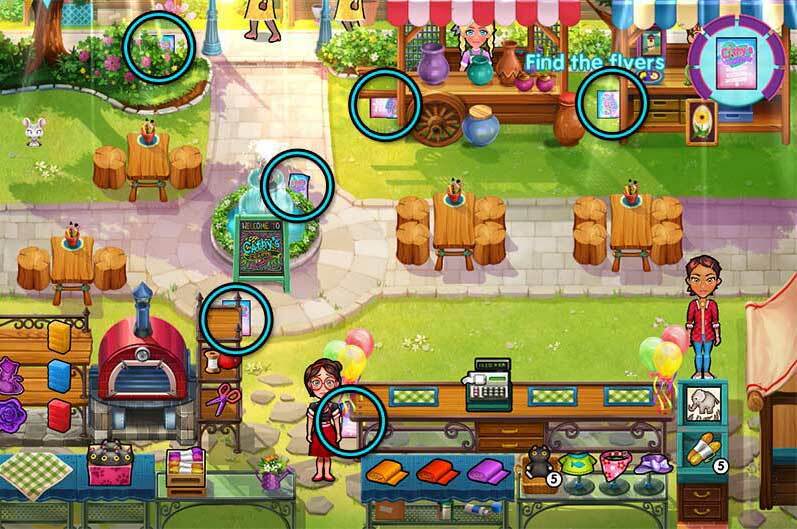 Level 3 – 4: Peeking around the right side of the counter with the cash register. Level 3 – 5: Peeking around the left corner of the bottom right table, to the left of the Ming notebook. Level 3 – 6: In the entrance doorway, peeking around the bottom of the door on the right. Level 3 – 7: Upside-down beneath the light between the two windows at the top of the screen. Level 3 – 8: Underneath the table with the sewing machine in the upper left corner of the shop. Level 3 – 9: At the top of Ming’s cat bed on the left. Level 3 – 10: In the right window, behind the red notebook with Ming on the cover. 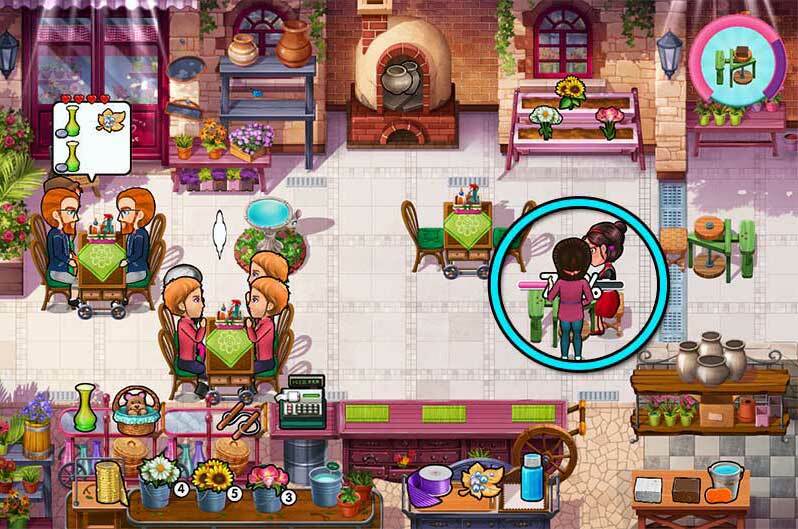 Level 4 – 1: At the left side of the table in the bottom right corner of the screen. Level 4 – 2: Over the bottom portion of the silver drainage grating toward the right side of the screen. Level 4 – 3: On the tile floor beneath the flower refill stand. Level 4 – 4: Behind the sign in the upper left corner of the screen. 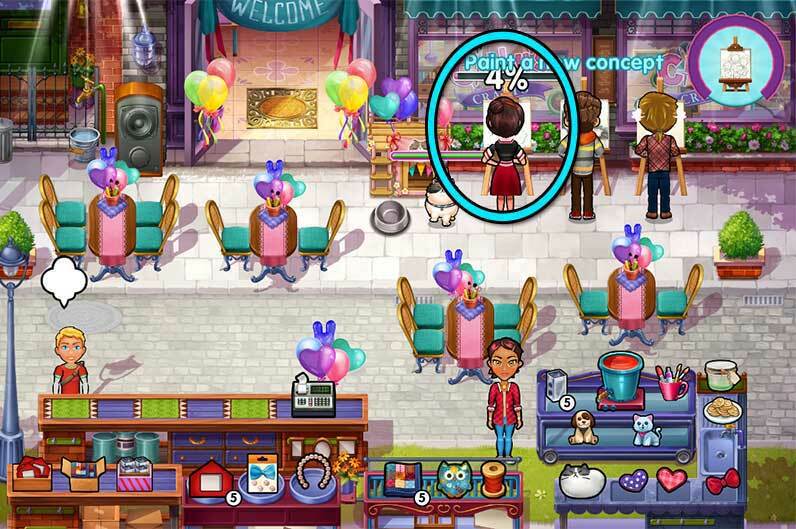 Level 4 – 5: Behind the right side of the fountain in the middle of the shop. 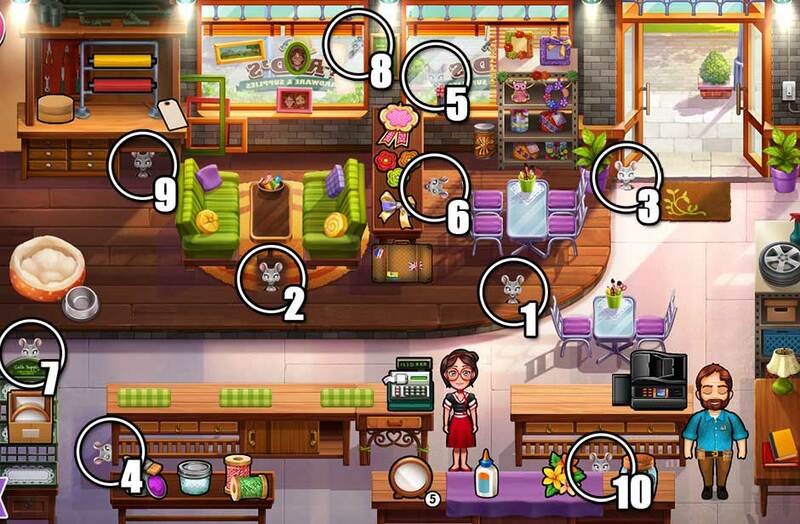 Level 4 – 6: At the top of the main counter to the right of the cash register, between the first two green placemats. Level 4 – 7: Underneath the left side of the bottom right table – the first single-person table from the left. Level 4 – 8: On the right side of the main counter to the right side of the cash register, behind the cart handle and wheel. Level 4 – 9: At the bottom left corner of the pottery kiln at the top of the screen. Level 4 – 10: Hanging upside-down underneath the right side of the large centerpiece bouquet of flowers. 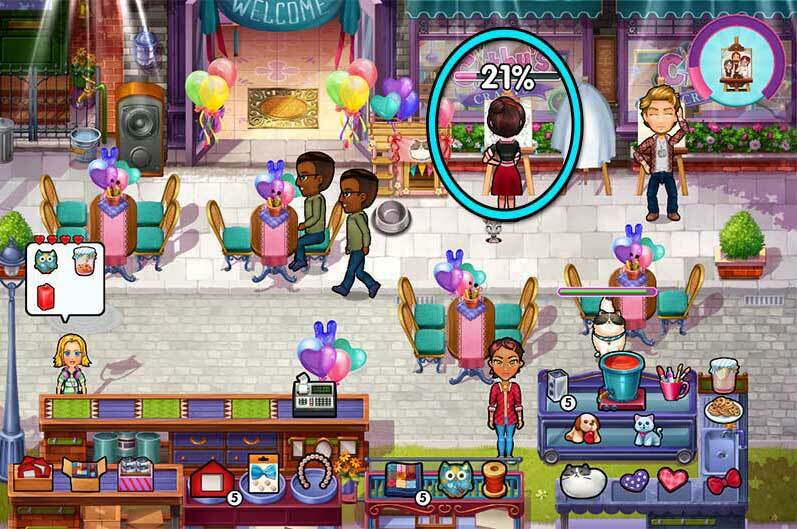 Level 5 – 1: To the left of Cathy when she’s standing at the cash register, at the foot of the customer counter. Level 5 – 2: At the bottom of the shelf in the upper left corner of the shop. 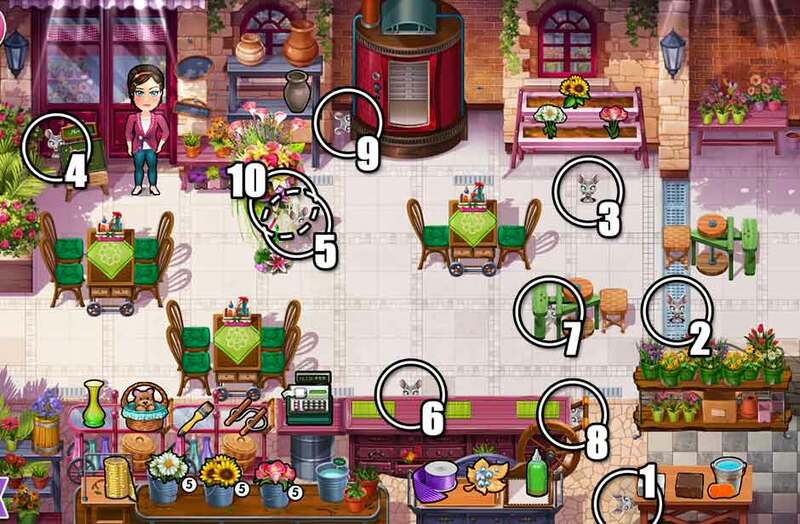 Level 5 – 3: Between the platter table and the flower pot beneath the window closest to the door at the top of the screen. 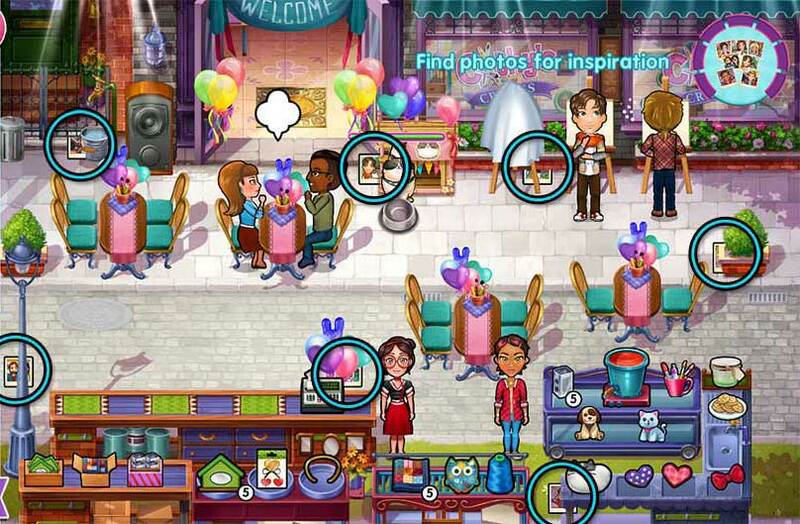 Level 5 – 4: On the left side of the bottom right table housing the corgi figurine. Level 5 – 5: Behind the right side of the top shelf to the left of the entrance doorway. Level 5 – 6: Peeking out from the bottom left corner of the left couch where the seniors are sitting. Level 5 – 7: At the top left corner behind the left couch where the seniors are sitting. Level 5 – 8: In the bottom right corner of the first window from the left. Level 5 – 9: Behind the top right corner of the bottom right cabinet, behind the refill box of corgi figurines. Level 5 – 10: On the floor between the table holding the frame and the cart holding the stencils. Level 6 – 1: In the doorway at the top of the screen, to the right of the doormat. Level 6 – 2: In the middle of the cobblestone pavement, to the left below the first table on the left. Level 6 – 3: Around the right side of the main customer counter, to the immediate right of the cash register. Level 6 – 4: Hanging upside-down from the “welcome” banner in the doorway at the top of the screen. Level 6 – 5: Behind the fence in the upper left corner of the screen. Level 6 – 6: Behind the candle-making station, between the candle mold and the pot of wax. 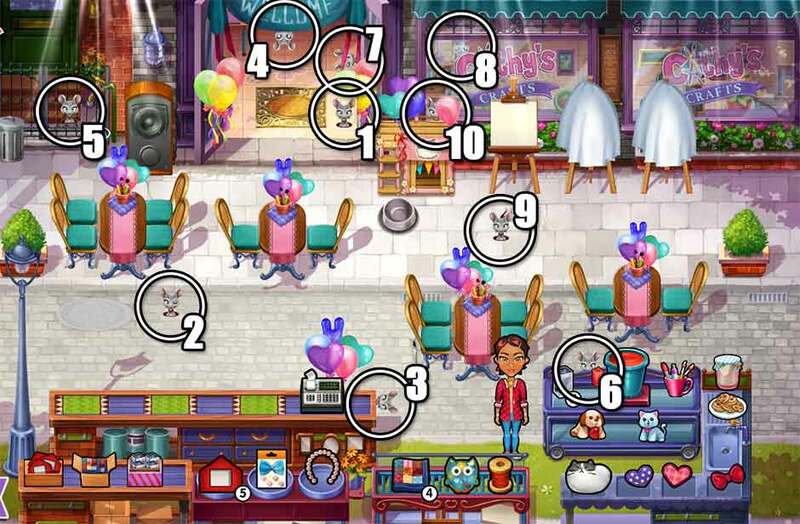 Level 6 – 7: Peeking out from the right side of the doorway at the top of the screen, above the balloons. Level 6 – 8: In the top of the window, above the “C” in “Cathy’s Crafts” above Cathy’s canvas. Level 6 – 9: In the middle of the cobblestone area, just below Cathy’s canvas. Level 6 – 10: In the window above Ming’s cat house, between the balloons. There are seventeen trophies to be unlocked while playing through Cathy’s Crafts. The following table names each trophy, the levels during which it can be unlocked, and how to unlock it. You can access the Trophies section of the game by clicking on the trophy icon located in the lower right corner of the map level select. Home 1 – 10 Finish 10 levels. Fair Lady 1 – 20 Finish 20 levels. Crafty Cathy 1 – 30 Finish 30 levels. 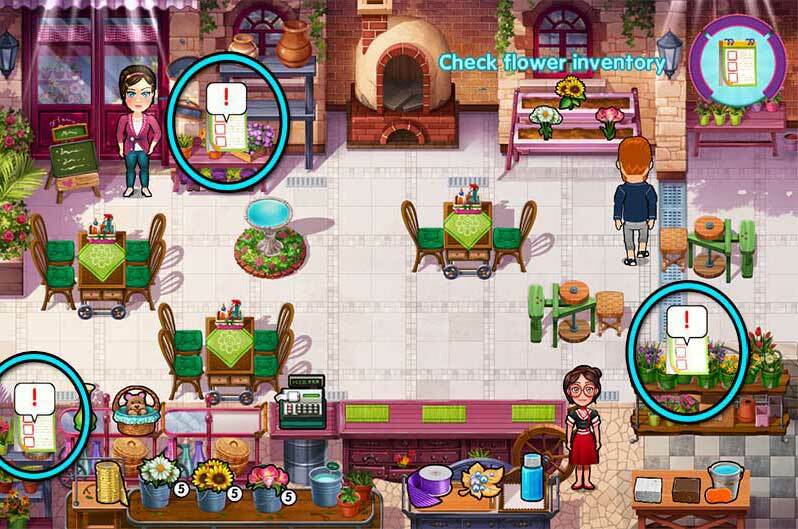 Flower Fever 1 – 40 Finish 40 levels. For the Love of Craft 1 – 50 Finish 50 levels. Fundraising 1 – 60 Finish 60 levels. Saving for the Future Any Earn 10,000 cash over your career. It’s possible to do this before completing all the game’s levels. 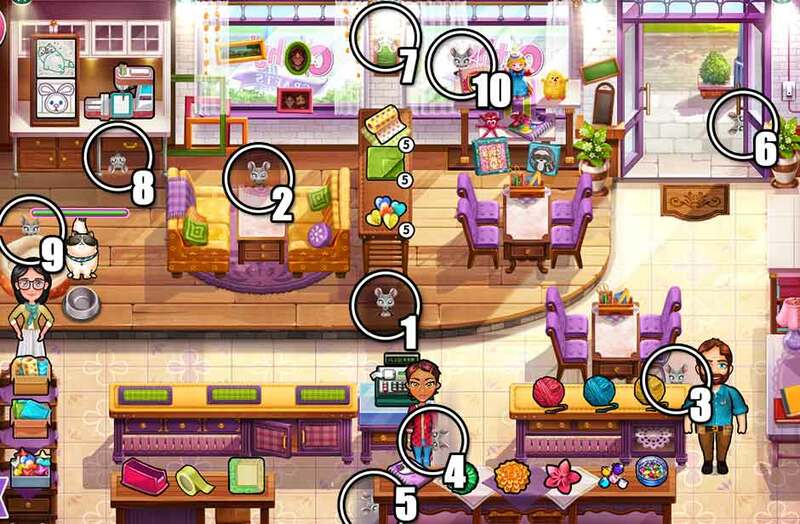 Shopaholic All Levels Buy every item for every store. Take Three! Any Deliver items to three different customers from a single tray. You must complete their orders for this to count. This is best done for single customers looking for 2 items at the end of a shop’s levels, when you will have more space on your tray to work with. What Should I Take? Any Complete a day having deleted 20 items from your tray. 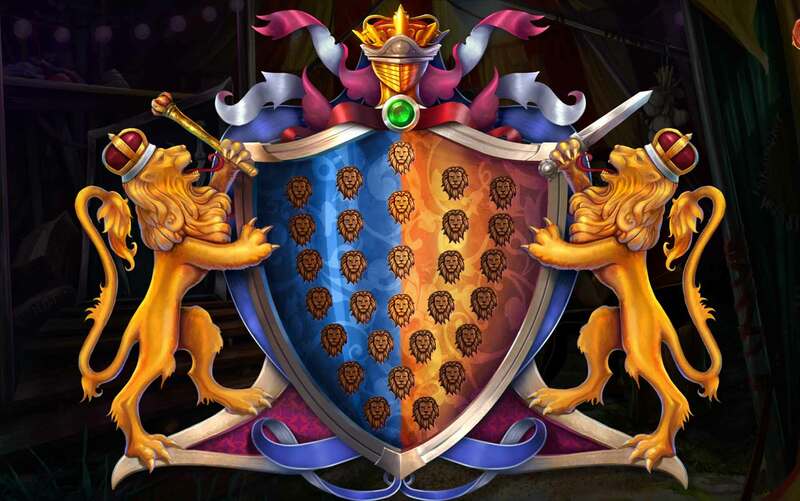 The easiest way to obtain this achievement is on one of the game’s earliest levels. Pick up and immediately remove the same item over and over until the achievement unlocks. Best Teacher Any Give customers a helping hand 50 times. This specifically refers to customers sitting at tables with a bubble showing Cathy’s face over their head in need of assistance with their crafts. Busy Bee Any Keep moving for 1 minute solid! Click between products that can be restocked to accomplish this if not unlocked during your main playthrough. Ka-ching! Any Use the cash register a thousand times. Neat Freak Any Clean all the tables before a shop closes. It’s best to only leave 1 table left to clean, if any, by the time your last customer is being checked out. This is easiest to accomplish in the first levels of the game. Craft Expert All Levels Earn three stars on every level. Cat Instincts All Levels Find all the mice on every level. See the Mice Locations section above. Spoiled Ming Any level with Ming Feed Ming the cat 100 times. Congratulations! You’ve completed our Cathy’s Crafts Official Walkthrough! Be sure to visit our blog for more great tips and tricks! The Cathy’s Crafts Official Walkthrough is meant as a guide and does not contain cheats, hacks, or serials.